There are plenty of Special Operations Forces and plenty of elements that claim to be Special or Special Operations Forces, but there is only one organization that is Special Forces—the Green Berets. Outskirts Press Releases New Book by Mark D. Boyatt, U.S. Army Special Forces Colonel Retired: Special Forces—A Unique National Asset: “Through, With and By” March 5, 2016 – Denver, CO and Fayetteville, NC – Mark Boyatt’s new book is an insider’s guide to the U.S. military’s Green Beret Special Forces—who they are, what they do, and what their role is in unconventional warfare. 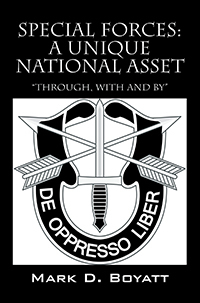 Special Forces—A Unique National Asset has been published by Outskirts Press, the fastest-growing full-service self-publishing and book marketing company. The term “special forces” is often misused by well-meaning but ill-informed people, including the news media, pundits, and even those in the military. The Army’s Green Berets are the only Special Forces in the United States military and represent the most adaptable and specialized organization in the nation’s arsenal. And their exploits hold a special fascination for the American public. Special Forces also defines “unconventional warfare.” Boyatt makes the case that unconventional warfare is a U.S.-supported and conceivably inspired insurgency or revolution. It is total warfare for the indigenous population, who must use every means at their disposal to effect regime change, whether they are a tyrannical government or an occupying power. The Green Berets’ adopted motto, “De Oppresso Liber,” which is Latin for “to free the oppressed,” is a call to duty special to this elite military force. While attending the Army War College, Colonel Boyatt authored a paper that originated and defined the term “through, with and by,” which is now codified in military doctrine and is the subtitle of his book. It describes the manner in which Special Forces meet the military and political objectives of the United States, working “through, with and by” other people, such as indigenous populations, rebels and revolutionaries, the oppressed and persecuted, displaced persons and refugees. Special Forces accomplishes this unique work by living with, training with, fighting alongside and even, at times, leading these groups. Mark D. Boyatt, US Army Special Forces Colonel Retired, was the Distinguished Honor Graduate of his Special Forces Officers Qualification class and earned the Green Beret. He served as the commander of three different Special Forces Operational Detachments "A" in the 5th Special Forces Group (Airborne). He commanded the first Special Forces Mobile Training Team to then North Yemen in 1979. From December 1984-May 1987 he served as the operations officer (S-3), 5th SFGA, then in the U.S. Army Special Operations Agency in the Pentagon until 1989. In 1989 he assumed command of the 1st Battalion, 1st Special Forces Group forward deployed on Okinawa, Japan. From 1993-1994, he was the Chief of Staff of the United States Army John F. Kennedy Special Warfare Center and School (USAJFKSWCS). 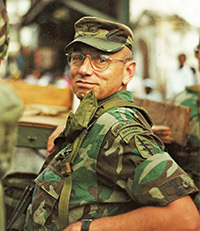 Subsequently, from 1994-1996, Boyatt was the commander, 3rd Special Forces Group and commanded the Army Special Operations Task Force during Operation Uphold Democracy in Haiti 1994-1995. He served as Deputy Chief of Staff for Operations, G-3, for the United States Army Special Operations Command from 1996-1998 and then as the deputy commander and assistant commandant USAJFKSWCS from April 1998 until his retirement in January 2000.